Wet age-related macular degeneration (wet AMD) is caused by the formation of new leaky blood vessels in the retina, a tissue at the back of the eye that is responsible for sight (senses light and forms visual images). These newly formed blood vessels can leak blood and fluid into the retina, which can result in physical changes in the structure of the retina and distort vision. Wet AMD is a leading cause of blindness in the U.S., and the rate of diagnosis is increasing as the aging population grows. The current standard of care is frequent injections of anti-vascular endothelial growth factor (anti-VEGF) into the back of the eye. Anti-VEGF protein therapy inhibits the growth of new blood vessels to prevent leakage, but requires frequent visits to the doctor for repeat injections (sometimes monthly) that are uncomfortable and inconvenient, adding a burden to patients and their families. Wet AMD is not a genetic disorder, but gene therapy may help by delivering a therapeutic protein to the eye with a one-time intervention. Our investigational therapy, RGX-314, is designed to use the AAV8 vector to deliver a gene to the retina. We believe that once the AAV8 vector delivers the gene to cells in the retina, these cells could produce an anti-VEGF protein. 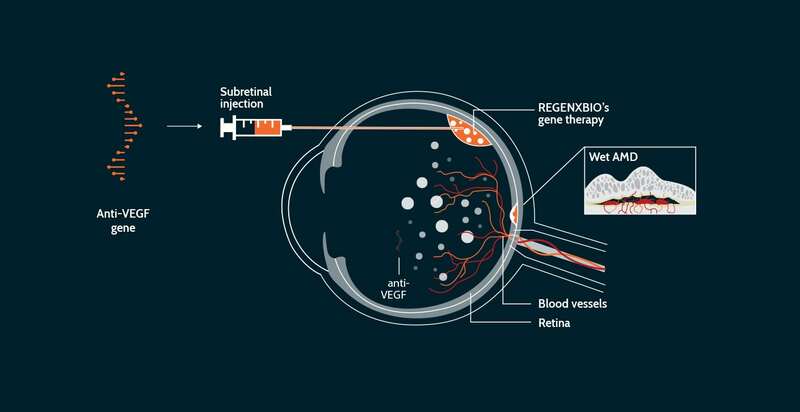 A single gene therapy administration has the potential to decrease or eliminate the need for frequent anti-VEGF injections to treat wet AMD. To learn more about the study, contact us or visit clinicaltrials.gov.